Winship Cancer Institute physician-scientist Mohammad K. Khan MD, PhD is the principal investigator of a new clinical trial that will study the effects of radiation therapy and immunotherapy in combination to treat melanoma and non-small cell lung cancer (NSCLC) patients with brain metastases. The study will use stereotactic radiosurgery and the anti-PD1 immunotherapy drug pembrolizumab. Radiation abscopal effect is a rare phenomenon in which radiation at one site can trigger a robust systemic immune response to help control distant, metastatic tumor sites. Abscopal effects have been studied in animal models using melanoma, lung cancer, breast cancer, renal cell, and other cancer cell lines. 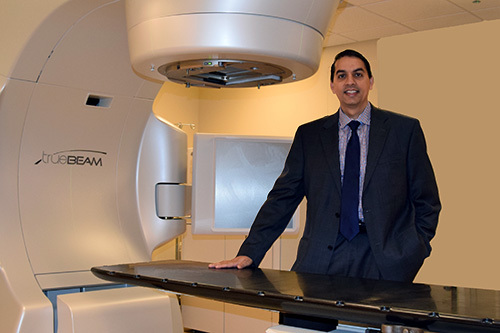 Khan's work in studying radiation induced abscopal effects, as well as work from others, have suggested that the post-radiation abscopal effects may be enhanced when combined with selective immunotherapy agents (in animal models). It is not known if this can be translated to patients. As such, Khan will lead one of the first investigator-initiated trials at Winship and in the state of Georgia to test if radiation abscopal effects in combination with anti-PD1 can help brain metastases patients. For more information, contact Lilly Masoumy, Winship clinical trial research coordinator at (404) 778-1960 or lily.masoumy@emory.edu.